It was beautiful and makes the future of public space travel all the more reachable. Jonathan Gonzalez reports for the NBC4 News at 4 Dec. 13, 2018. Virgin Galactic completed its longest rocket-powered flight ever on Thursday, taking a step ahead in the nascent business of space tourism. The two pilots on board Virgin Galactic's spacecraft Unity became the company's first astronauts. Virgin Group founder Richard Branson was on hand to watch the historic moment. 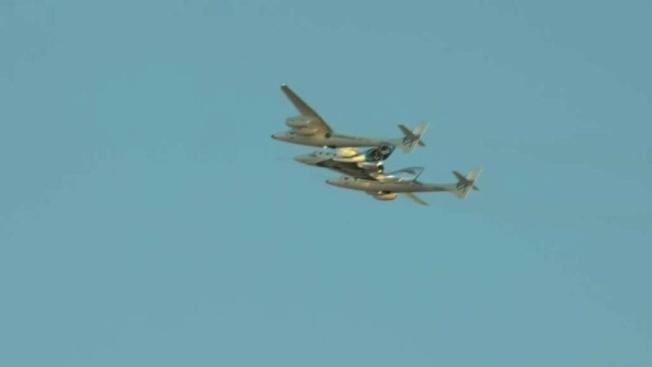 Virgin Galactic said the test flight reached an altitude of 51.4 miles, or nearly 83 kilometers. The U.S. military and NASA consider pilots who have flown above 80 kilometers to be astronauts. Test pilots in 2004 were awarded a commercial astronaut badge by the Federal Aviation Administration for flying a previous, experimental iteration of Virgin Galactic's spacecraft design. WhiteKnightTwo is taking SpaceShipTwo to release altitude at which point SpaceShipTwo will be released and the rocket motor ignited. Lifted by the jet-powered mothership Eve, the spacecraft Unity took off from the Mojave Air and Space Port in the California desert. Upon reaching an altitude above 40,000 feet, the carrier aircraft released Unity. The two-member crew of Mark Stucky and Dave Mackay then piloted the spacecraft in a roaring burn which lasted 60 seconds. The flight pushed Unity to a speed of Mach 2.9, nearly three times the speed of sound, as it screamed into a climb toward the edge of space. After performing a slow backflip in microgravity, Unity turned and glided back to land at Mojave. This was the company's fourth rocket-powered flight of its test program. Unity is the name of the spacecraft built by The Spaceship Company, which Branson also owns. This rocket design is officially known as SpaceShipTwo (SS2). Unity also carried four NASA-funded payloads on this mission. The agency said the four technology experiments "will collect valuable data needed to mature the technologies for use on future missions." "Inexpensive access to suborbital space greatly benefits the technology research and broader spaceflight communities," said Ryan Dibley, NASA's flight opportunities campaign manager, in a statement. The spacecraft underwent extensive engine testing and seven glide tests before Virgin Galactic said it was ready for a powered test flight — a crucial milestone before the company begins sending tourists to the edge of the atmosphere. Each of the previous three test flights were successful in pushing the spacecraft's limits farther. Branson told CNBC in October that his company was "more than tantalizingly close" to its first trip to space. Branson's space company has "a step-by-step cautious approach" in its testing program, he said, doing "whatever it takes to make absolutely certain that we've put everything to bed" before trying to send humans into space. Thursday's successful flight was its fourth rocket-powered launch since the fatal crash of its Enterprise spacecraft on Oct. 31, 2014. Unity underwent extensive engine testing and seven glide tests before Virgin Galactic said it was ready to make another rocket-powered flight. Once Virgin Galactic has "a safe craft" that can reach more than 264,000 feet, Branson said, he will go up. A key part of Virgin Galactic's plan to turn space tourism into a business is rapid reuse of the spacecraft. By completing multiple spaceflights this year, each separated by only a few months, Virgin Galactic is closing in on that goal. Branson is now a step ahead of fellow billionaire Jeff Bezos in the space tourism business. Bezos has been pouring nearly $1 billion a year from his Amazon holdings into Blue Origin, the rocket-builder he founded. Blue Origin is in the final stages of testing its New Shepard rocket, most recently launching its capsule to 322,405 feet in an eighth successful flight on April 29. But Blue Origin's aim of launching tourists to space on New Shepard this year have been delayed, with the company now targeting early next year. Branson has said he does "not see this as a race," despite the comparison often arising. Virgin Galactic has more than 600 would-be astronauts signed on to launch, with tickets priced at $250,000 per flight.